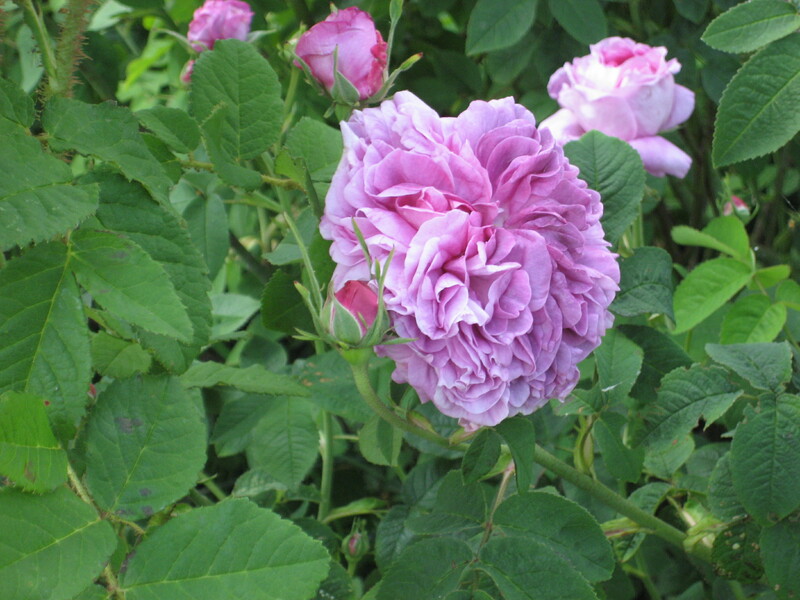 A beautiful and very fragrant rose with big pointy rose buds and long sepals, which open into large lilac colored double flowers with a purple undertone. The large, almost thornless shrub has light dull-green leaves and sturdy branches. This is a summer flowering rose, but with a long flowering period from late May to late July. Unfortunately, there is little known about the origin / ancestry of my rose, of which several varieties are sold under the same name: a pink and a white rose and even sometimes the rose ‘Madame Hardy’ is offered as ‘Comtesse de Lacépède’, but that’s a totally different rose, with strong thorny branches and soft leaves. Several sources pretty much agree that the real ‘Comtesse de Lacépède’, is a white Gallica hybrid, bred by Charles or Hippolyte Duval in France in 1840 and introduced by Verdier and son in France. In the book ‘The Old Rose Advisor, Volume I’ by Brent C. Dickerson the description of this rose is the following: “Hybrid China: “Growth vigorous, with green canes bearing close-set thorns which are slender and of varying lengths. Beautiful green leaves in two or three pairs with an odd one, bordered purple when young. Flower round, very full, flat, white with some flesh; outer petals very large and pointed with small foliaceous processes at the base” ..[John Cranston:] “The Comte de Lacépède, alias Bernard Germain Étienne de la Ville sur Illon, was a naturalist (lived 1756-1825)..”). On HMF I’ve heard about the existence of a rose called ‘Comte de Lacépède’, which rose has a description that could fit my pink rose: (Pink, lilac shading. Large, full (26 -40 petals) bloom form. Once-blooming spring or summer). Ref: Old Roses-The Master List 2nd ed p347: ‘Le Comte Lacépède’ (Vibert, 1830) Gallica. Syn: ‘Comtesse Lacépède’ Lilac pink to pink vinous. So maybe my comtesse is a comte, because of a mix-up in previous years?